This is a list of Presidents of Indonesia. The presidency was established during the formulation of the 1945 constitution by the Committee for Preparatory Work for Indonesian Independence (BPUPKI), a research body for the preparation of Indonesian independence. 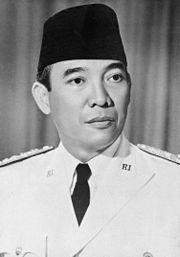 On 18 August 1945, the Preparatory Committee for Indonesian Independence (PPKI), which was created on 7 August to replace BPUPKI, selected Sukarno as the country's first president.